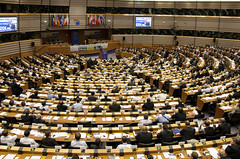 European Chambers of Commerce and Industry, 14 October 2010, a photo by President of the European Council on Flickr. Before I moved to Scotland in 2002, one of my main political interests was the European Union, and I went on a number of study tours to Brussels to visit the European Parliament and talk to politicians there. One of the questions I spent many hours discussing back then was the absence of a European demos and how to create one. What this meant was that we could see that most Europeans were primarily concerned with the politics of the countries they lived in, and they discussed European politics in that framework. Even in areas where the EU is much more powerful than the member states (such as international trade negotiations, or fishing quotas), there never is a single European debate but instead there are separate debates in each country. A European demos would involve the creation of a place where people from everywhere in the EU could discuss political questions with each other instead of having to go through a national layer. Nothing much ever came of our discussions. Even today, when it’s so easy to create a pan-European website, almost nobody accesses those sites instead of national media and blogs. However, when I look at the Scottish independence debates in Scotland and in London-based media, I can’t help thinking back to some of the old demos discussions. Is there a such a thing as a British demos today? Of course it’s possible to live in Scotland and get your news primarily from the BBC and the Guardian, for instance, but at least amongst the independence campaigners it seems to be the rule to get your news mainly from Scottish blogs, newspapers and TV programmes, whereas the UK-wide ones are mainly ignored (except as examples of scaremongering). Are we seeing the separation of the Scottish demos from the UK demos, or has the latter never existed? When we bemoaned the lack of a European demos, our main concern was that it was hard to make the EU fully democratic without one. In the same way, if the Scottish demos is now separate from the rUK one (and it’s hard to argue it isn’t when you look at the massive ignorance of the Scottish independence debate you see in London-based media), a UK-wide democracy becomes almost impossible, and Scottish independence is the obvious solution to rectify the problem. I very much look forward to the day when we have EU discussions in Holyrood. Funny, but in many ways I feel like politics in Scotland is far more European than it is in Westminster.